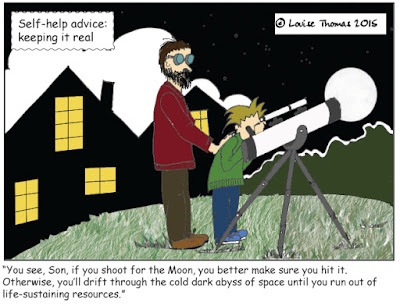 The saying: "Shoot for Moon, even if you miss, you'll land among the stars" has always bothered me. Here's my take on sound advice. 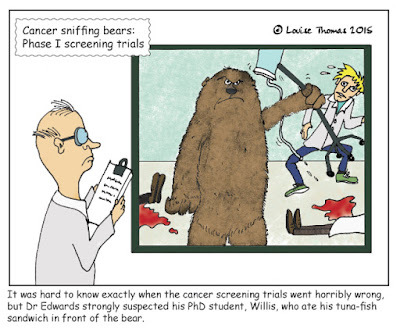 Just imagining how cancer-sniffing bear trials would go down. Could be bad taste? Sometimes I worry I've lost track of what's acceptable in society - apparently gardening in my slippers is crossing a line. 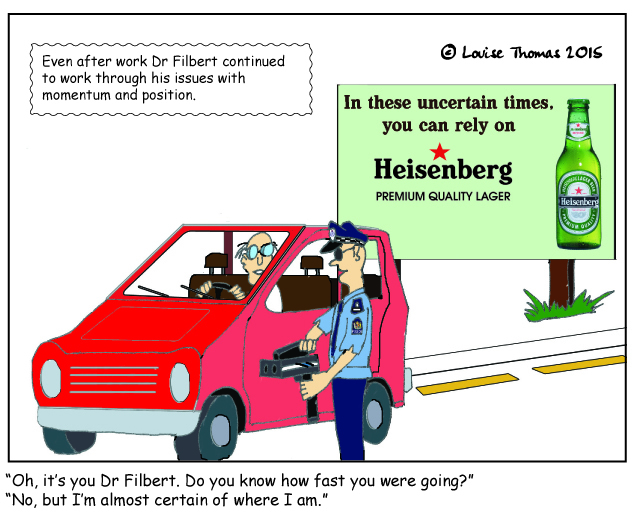 Even I'll admit this one's a bit naff - still, it's been a slow week. Have a good weekend all. Just a warning – I’m writing about netball again. But that’s okay, I’m really writing about life when I do. In the past week I’ve disagreed with someone about something. Not to their face, I’m too non-confrontational for that. 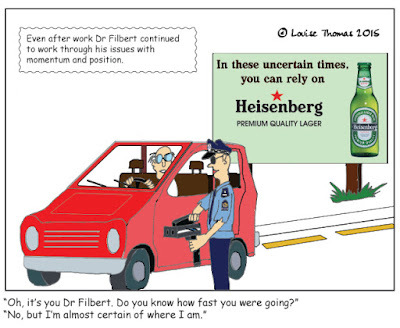 But it was a disagreement with something I read in the newspaper. 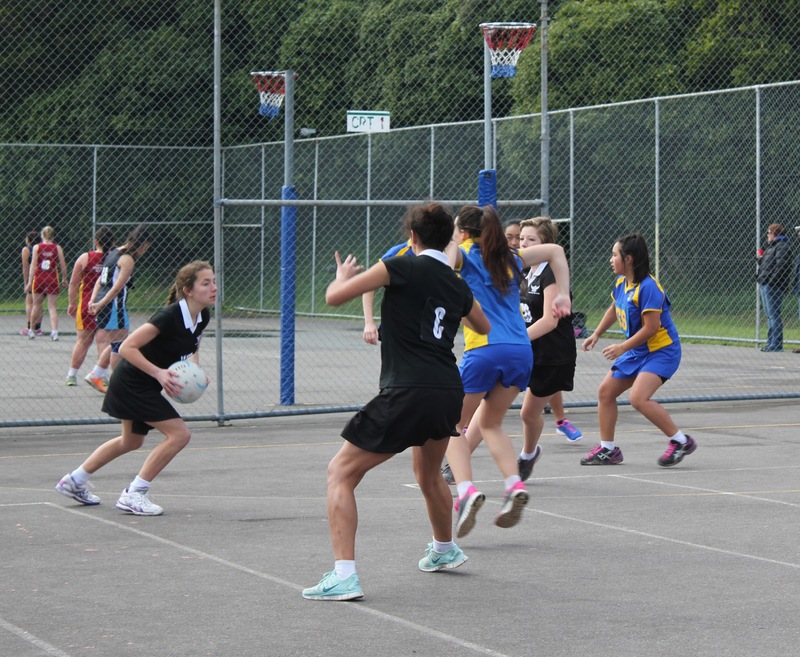 It was an article in the DomPost (a newspaper here in New Zealand), “Hutt Intermediate just beat netball rivals Maidstone”, by Nicholas Boyack (http://www.stuff.co.nz/dominion-post/sport/71718381/hutt-intermediate-calls-on-boy-to-beat-netball-rivals-maidstone). When I read it, I nearly spat my tea out. If you have time, go read it so you know what I’m going on about. For those that don’t have time, the netball coach being interviewed was saying how marvellous it is to have boys on girls’ netball teams because they are big and intimidating. I feel weird when I don’t agree about something. I think I’m a bit of a people pleaser, so when something bothers me enough to disagree, I can feel the internal conflict going on in my head. Am I the one with the wrong thinking? Do others think the same as this other person? Am I just looking for evidence to support my view point instead of being open minded? I also feel weird expressing an opinion sometimes, especially when it might provoke criticism or step on a few toes. But a wise friend once told me (I use “once” to give it gravitas – this really only happened last week) that if we never share ideas and opinions then we have to accept things the way they are. It’s only through sometimes expressing your opinions that you can start a conversation and affect change if it is needed. So, back to the netball. I appreciate it is not uncommon for some school netball teams to field one or two boys, but perhaps there needs to be a wider informed debate in New Zealand about boys participating in girls’ sports. The right to include up to three boys (two in some centres) in a primary netball team probably started as a way for smaller schools and clubs to be able to field teams and that’s fine. However, as the coach said in the referenced article they are now used at intermediate school level (ages 11-13 years) to speed the game up and intimidate on court because of their height and speed. This is not a criticism per se of the school in the article or their coach; they are working within the rules. Although I do question the “in it to win it” by any means within the rules by many schools who participate in national intermediate tournaments (AIMS Games) when so many sports studies show that youth athletes value participation and enjoyment more than winning, and it is the participation which contributes to improved self-esteem, confidence and athleticism among girls. It’s hardly rocket science that players who enjoy sport, participate more and over a longer period in life and develop overtime a passion and skill in a particular sport regardless of any game’s outcome. I also question whether it is fair to expect girls to compete against boys by intermediate age, when the onset of puberty is giving some boys undeniable physiological advantages in speed and strength. There seems to be little in the way of studies into the impact of boys playing in girls’ teams, but there is much anecdotal evidence that the practice denies opportunity for girls, creates a competitive advantage and increases risk of injury. At present, boys are not able to play in girls’ teams once they reach secondary school level, so all that happens is that some girls have been denied an opportunity to play at a higher level at intermediate and are therefore less developed than they might have been when moving on to high school. The University of Canterbury currently has a study underway trying to understand New Zealand’s high drop out rate from sport of 13 to 16-year-old girls. I look forward to the findings, but perhaps I could predict that while there will be many causes, some of the issues might be around intermediate schools and some parents treating the children in their care as professional athletes and placing undue pressure on them around winning and losing. There is also some evidence to suggest that some girls may become more self-conscious and lose confidence playing against boys in early adolescence. This combined with having to compete physically against boys may put many off sport. I’ve witnessed first hand girls, normally good defenders, back off defending against a boy because they don’t want to defend him as closely as they would a female opponent. Also, when there is a loose ball, they tend to let the boy take it rather than scramble to compete. I realise the “Politically Correct” approach is to treat everyone the same, regardless of gender, partly through fear of being labeled sexist. The problem is we are not all the same, and, as stated, there are often huge differences between the speed and strength of boys and girls, particularly among males who develop early. I would also point out that overseas studies into the onset on puberty aren’t entirely relevant in the New Zealand context, as Pacific and Māori children tend to undergo puberty earlier and are taller for their age than European children. In the interests of developing netball in New Zealand, perhaps it’s time to call on our social and sports scientists to look into the issue of boys in girls teams, particularly at intermediate age, where there is the disturbing practice, of selecting, even recruiting, tall/bulky athletic boys into top teams. 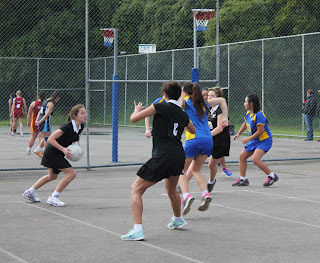 I know of several cases where boys have been recruited into teams, where they did not participate in the usual trial process all the girls were required to go through and they have come into a team with little or no knowledge of how to play netball – they were simply recruited because they are sporty and have the right build and aggressive attitude. What message does this send those girls who have competed in trials over several days to earn a spot in the team they are in? If the anecdotal evidence stands up, maybe Netball New Zealand needs to reduce the age range in which boys are allowed to compete in girls’ teams. Or, at the very least, call it what it is – a mixed team that should only compete against other mixed teams, not in girls’ competitions. Not strictly relevant to the issue of boys playing in girls netball teams, but I might also point out that the sporting opportunities, funding and recognition in general available to boys and men by far and away exceeds the opportunities available to girls and women. Are we taking something else away from them now as well? How’s that for an opinion? It's been a busy week creating a new website for a new research association. I'll put the link up as soon as they go public, but it includes a great free online library of scientific papers for those interested in land rehabilitation. 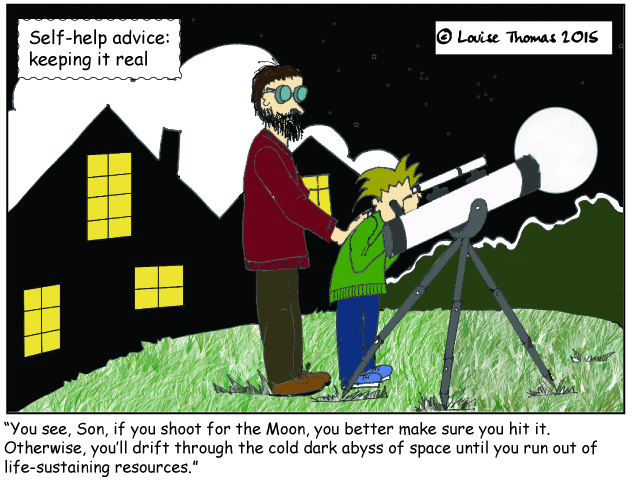 In the meantime, here's a new cartoon I made this evening - look who's figured out how to add colour using photoshop - thank you Youtube! 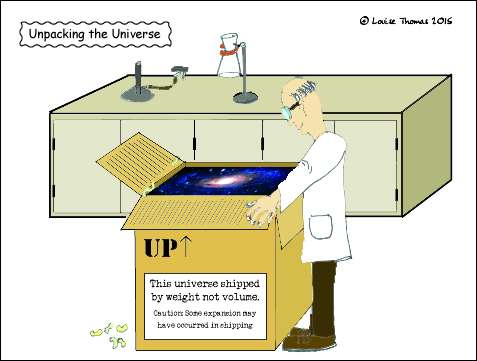 This Universe shipped by weight not volume. Caution: Some expansion may have occurred in shipping.